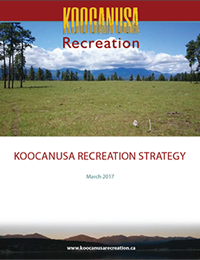 The Koocanusa Recreation Strategy was developed to foster more sustainable and responsible recreation on Crown lands, while providing opportunities for local stakeholders and stewardship groups to play key roles in recreation management. The strategy was created after extensive consultation and engagement, including a partnership with the local Koocanusa Recreation Public Advisory Group, four community open houses and a recreation management survey that received more than 1,100 responses. 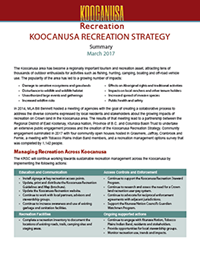 Continue to educate recreation users about appropriate Crown land behaviour through signage and by distributing the Koocanusa Recreation Guidelines and Map. Support the Koocanusa Recreation Steward Program, which provides two additional natural resource enforcement officers for the Koocanusa area. Complete a recreation inventory of existing roads, trails, camping sites and staging areas. Continue to engage with local partners, advisors and stewardship groups. The Strategy also includes specific management actions for the Dorr-Grasmere area, defined as the Crown land south of the Elk River and west of Highway 93, extending south to the U.S. border. Dorr-Grasmere was identified as an area where current recreation use patterns are significantly impacting Crown land values, and where more specific management approaches will be implemented over two phases starting in 2017. The focus of phase one is identifying and directing recreation users toward appropriate trails, camping areas and parking and staging areas. Phase two will focus on formalizing a network of recreation trails and supporting facilities through regulation. This approach is expected to mitigate the growing number of recreation impacts while providing opportunities for continued recreation use in the area.